Back in March, in the Philippines, we met Omar and Tanja from Switzerland. 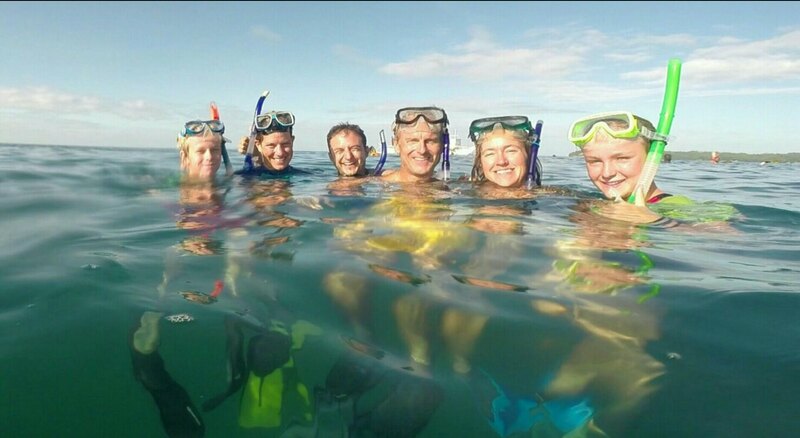 In Donsol, we snorkeled with whale sharks with them. Here’s a picture of us with them in the Philippines. 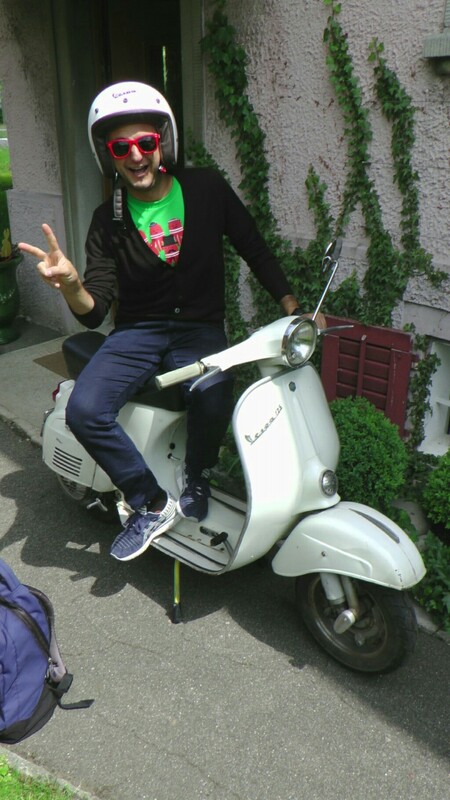 Omar is Italian and Tanja is Swiss, and they live in Zurich. 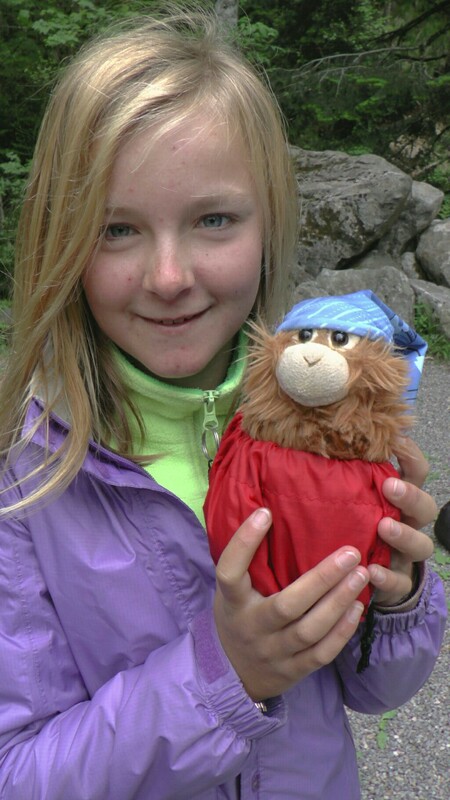 We were in Schwangau, Germany, not so far away, and decided to take them up on their invitation and go visit them! Since we lost a week in Frankfurt, we no longer had the time to cycle our entire planned route. 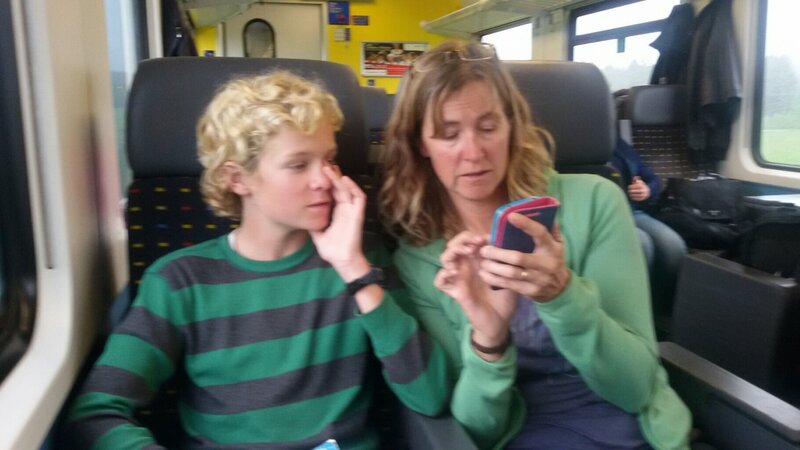 So, we sometimes take trains when the weather gets bad. Well… as the forecast warned us, we woke up to a very gloomy day at our Schwangau campground. We lay in bed for a while trying to coax ourselves to get up. When we finally did, it was the most awful feeling to pack up the tent in the rain. It wasn’t hard for us to make the decision of “ride or train?”. I didn’t want to get my socks wet during the 7 km ride from our campground to the train station, so I went with bare feet in sandals. Ouch! Cold cold cold! My dad takes his blog very seriously. Jake and my mom take their game of 2048 very seriously. I knew that crossing borders between European countries was easy, but I didn’t know that it would be that easy! The only thing that made us realize that we had crossed the border was that our German sim card in our phone wasn’t working anymore. Otherwise, there was absolutely no indication. Our plan was to take the train all the way to Zurich Hauptbahnhof (central station) and then ride our bikes to their place. 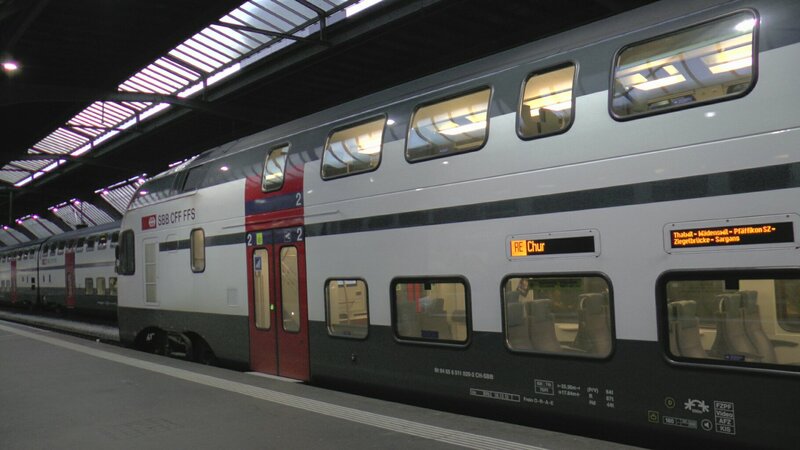 But as the train was stopped at the Zurich airport, Jake remembered that they had said that they live very close to the airport. We all agreed to get off there instead. If you think this looks funny, imagine my dad going up with his trailer! We were just laughing at ourselves the whole time. But the funny adventures weren’t over: we still had to find our way to their house. It was pouring rain. My dad had some idea of how to find their place, but in this case, reality was not as google maps thought it was. Long story short, we ended up on a big 4 lane highway going around roundabouts with huge semis whizzing past. It was scary. Finally, my dad saw the road that we wanted to be on, only it was under us! With no paths connecting the two roads, we had to go through the forest! A few more kilometers of riding finally brought us to their house. They live in Tanja’s grandfather’s house, a big, nice old home in the outskirts of Zurich, in a neighbourhood called Rümlang. They can be in the city center by a one minute walk and a 12 minute train ride. It was so great to see them again! It was also great to be dry again! That night, they cooked us an authentic Swiss meal: raclette and fondue. I’m not really a cheese person, but even I really enjoyed that meal. We caught up with them about our travels after leaving Donsol. They spent some more time in the Philippines before going to Japan. They have also been to Nepal on a previous trip, so we talked about that too. We were a bit crunched for time, but had planned for one full day in Switzerland. 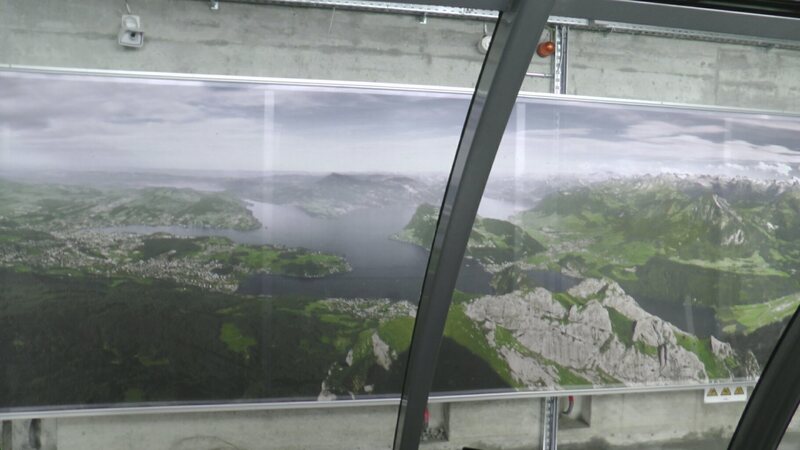 Omar and Tanja suggested to do the Pilatus mountain circuit. 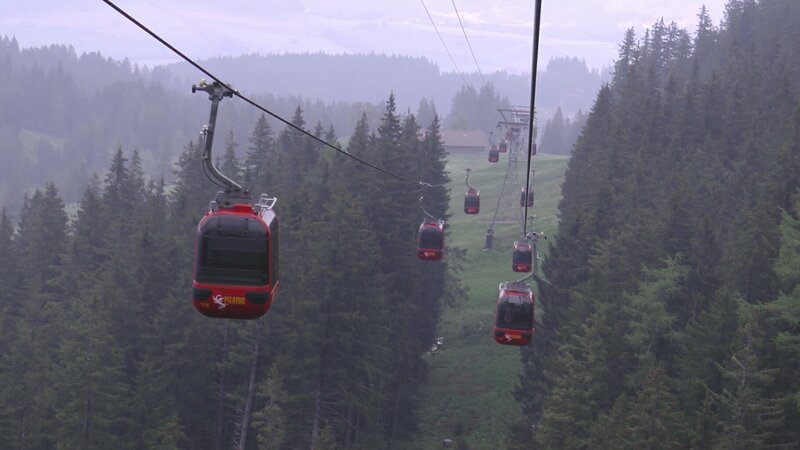 It includes a cog railway and a gondola. And at the top, there are amazing views! 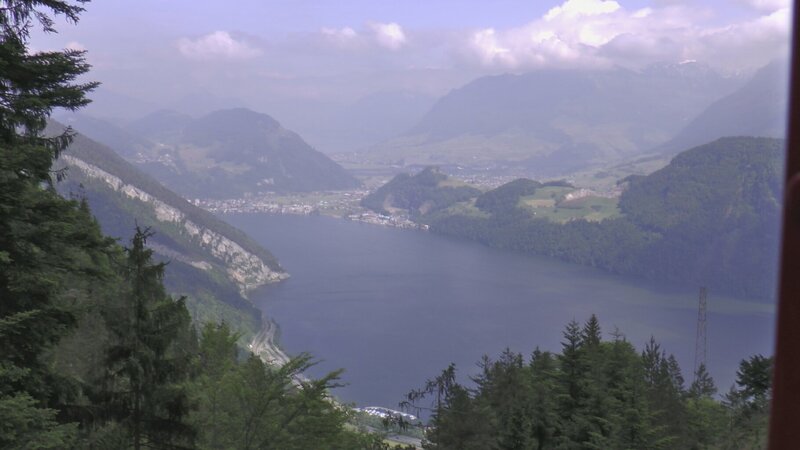 It is near the city of Luzern, which is about 40 minutes from Zurich by train. The cog railway starts in a place called Alpnachstad, so we had to take another train from Luzern. Our ticket said platform 14. Twelve minutes before the departure time, we saw a train parked at our platform. Assuming that it was the one, we got on. My dad needed to use a bathroom. The ones on the train were all full, so he got off to use the station bathrooms instead. No problem, there were 12 minutes left. One minute later, the train started moving! Oh no! We quickly realized that we were on the 1:01 PM train, not the 1:13 PM one. This train was, for a few stops, heading towards Alpnachstad, but turning off before that stop. Our general rule on this trip was: if we get separated, we return to the last place we saw each other. That was platform 14 of the Luzern station. We got off our wrong train at the first stop and took the next train back to Luzern. Oh, shoot! Daddy’s not there! We had all of the stuff, money, train tickets, phones, everything. We couldn’t contact him, as he had no phone. Still, we sent an email to his account in case he somehow checked it. 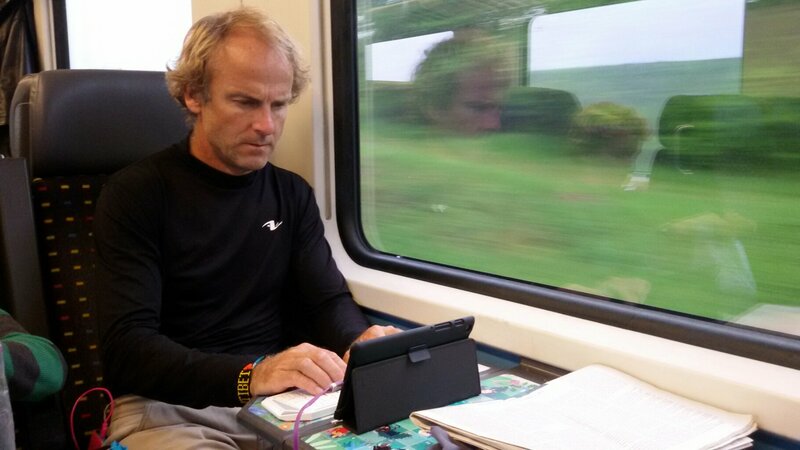 After a while, we finally came to the conclusion that he must have gotten on the right train and was now at Alpnachstad. 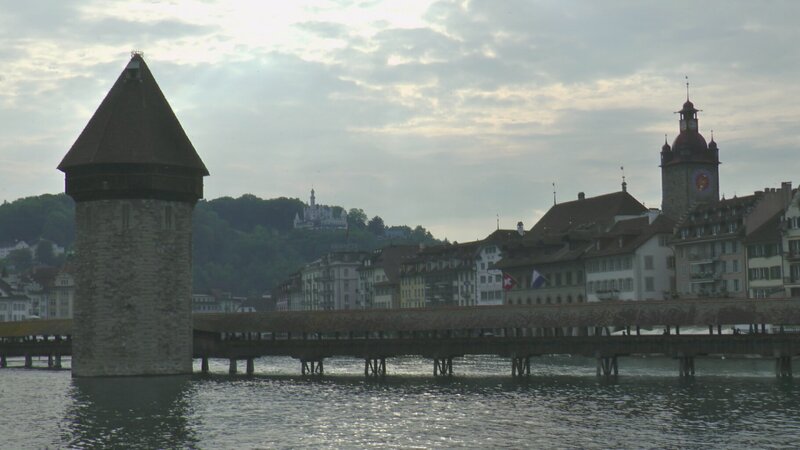 But we were afraid that if we went there, he would come back to Luzern, and so on. We didn’t budge from platform 14. Meanwhile, my dad was waiting at Alpnachstad. He was so hungry, and had 1,85 Swiss Franks in his pocket, enough to buy a Bounty bar, but not a Mars bar. When he borrowed a computer to check his email, he saw ours in his inbox. 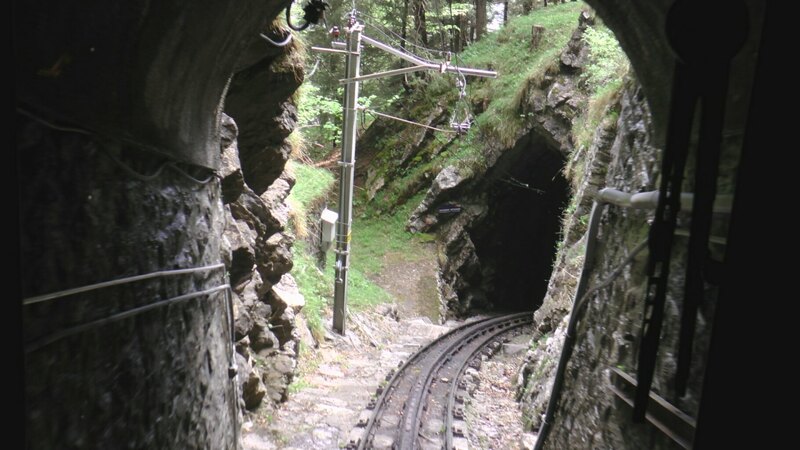 He responded with “come to Alpnachstad – I’m not going back to Luzern – this is where the cog railway starts!”. Finally, we were on the train to meet him. It was a guessing game. He assumed that we would assume that he had gotten on the right train. We were playing by the rules. Also, we didn’t think that he would get on a train without a ticket! That separation delayed our day by about 2 hours. But that was water under the bridge, once we ate our much needed lunch! 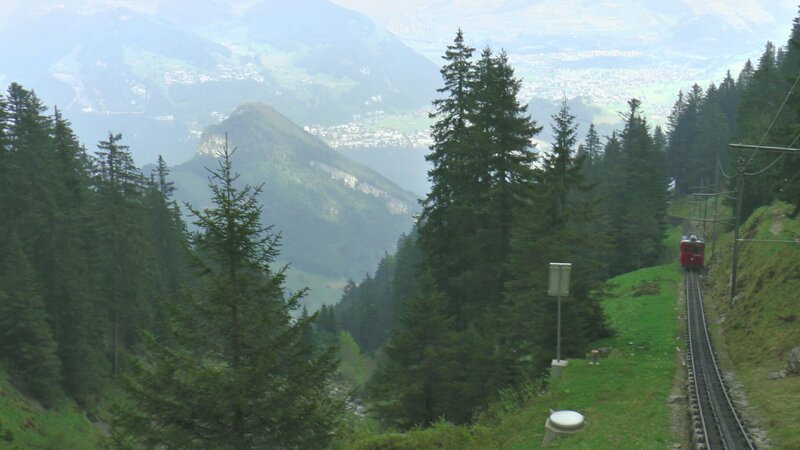 OK, let’s do what we came here to do: go up the Pilatus mountain on the cog railway. 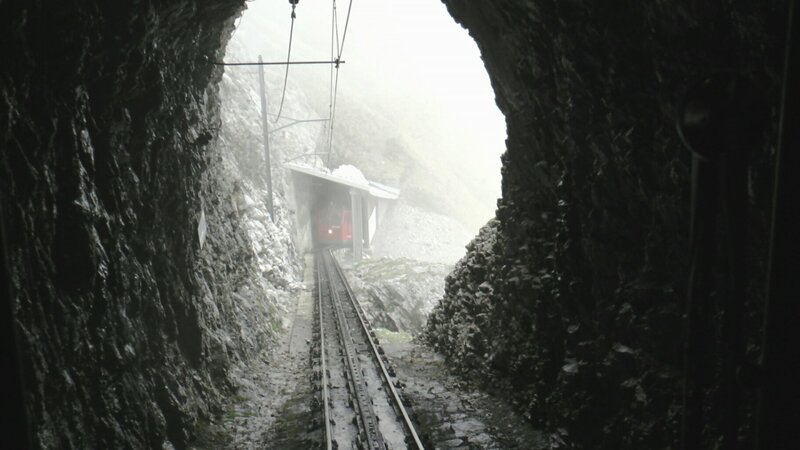 A cog railway is different than a usual train, though. It’s specially made to go up very steep slopes. Instead of the power going to the train wheels, like a normal train, the power goes to a big wheel with teeth in the center of the train. The teeth interlock with teeth in the track, and that’s how it goes up. 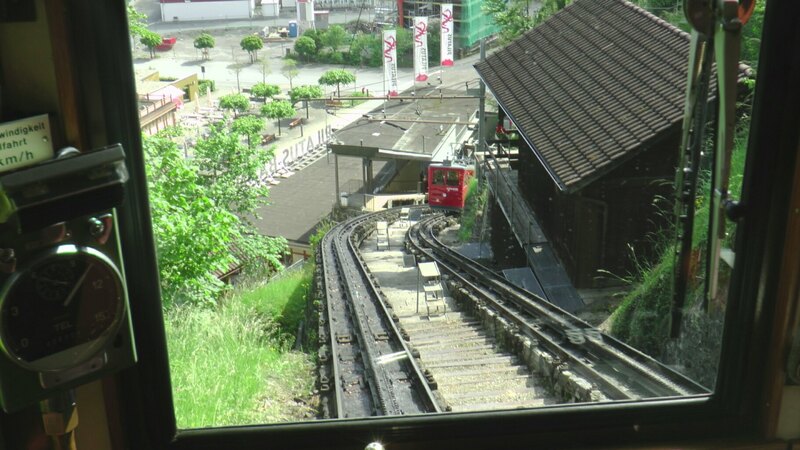 The Pilatus cog railway is the steepest train in the world! At its steepest, it’s 48% inclination. The train is built “diagonally”, because it only services this mountain! 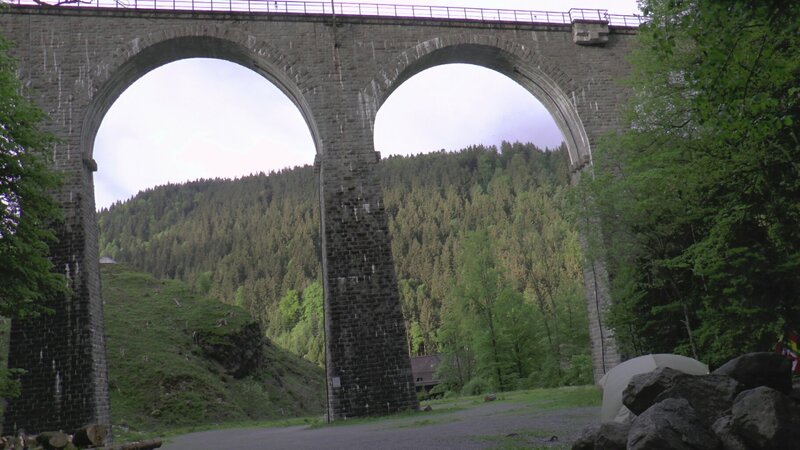 The track is 4,6 km long, and, amazingly it was first opened in 1889, using steam power! Wow! There were about 4 or 5 tunnels. At first, we had some pretty great views! But, then as we got up higher, the clouds started rolling in. 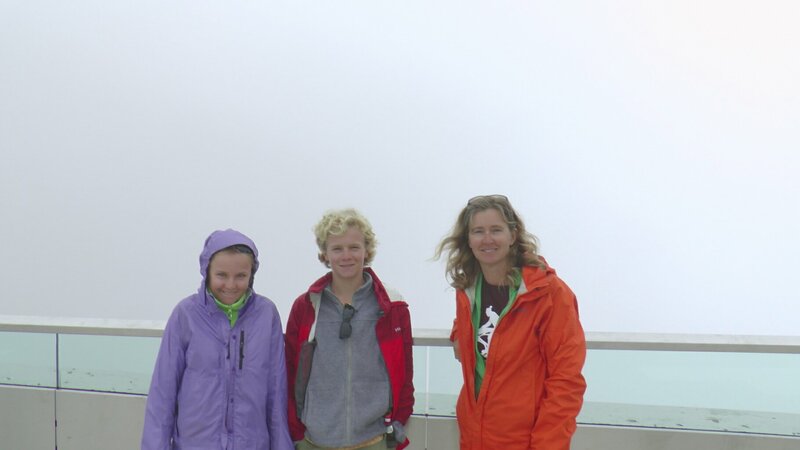 By the time that we were at the top at 2073m above sea level, we were literally inside the cloud. 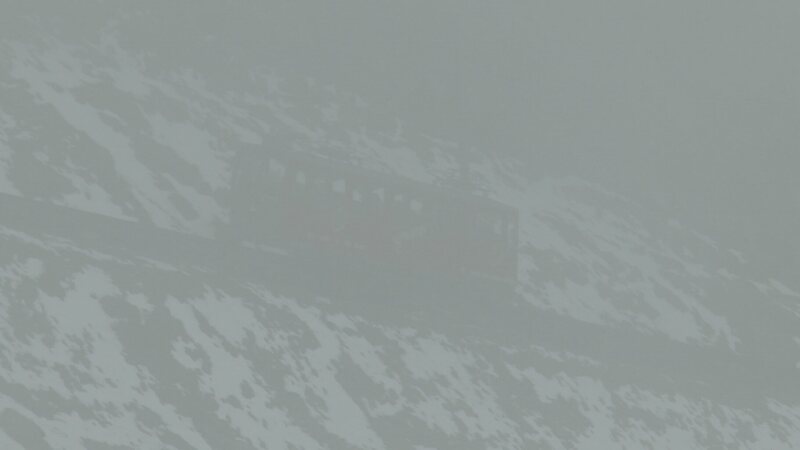 We could hardly see the cog railway anymore. We didn’t spend too long at the summit, as there was nothing to see. Aww... apparently that's what the view looks like on a sunny day! 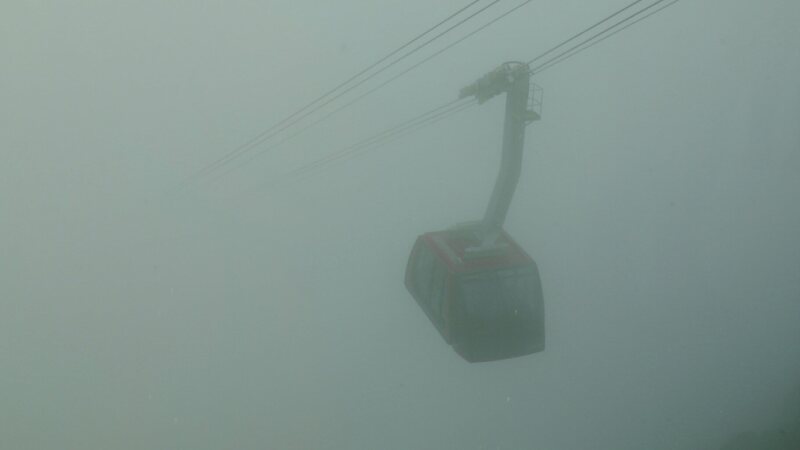 To get back down, we took the gondola that goes all the way back to Luzern. Yay, we're finally getting out of the cloud! And back in Luzern, we took a short bus ride to the downtown. 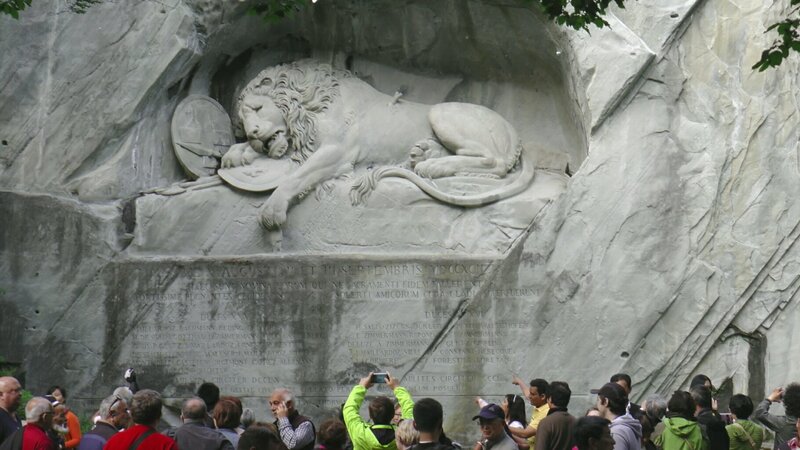 Our favourite thing in Luzern town was the lion monument. Someone told us “follow the tourists to find it!”. And that was good advice. It is the saddest carving I’ve ever seen. 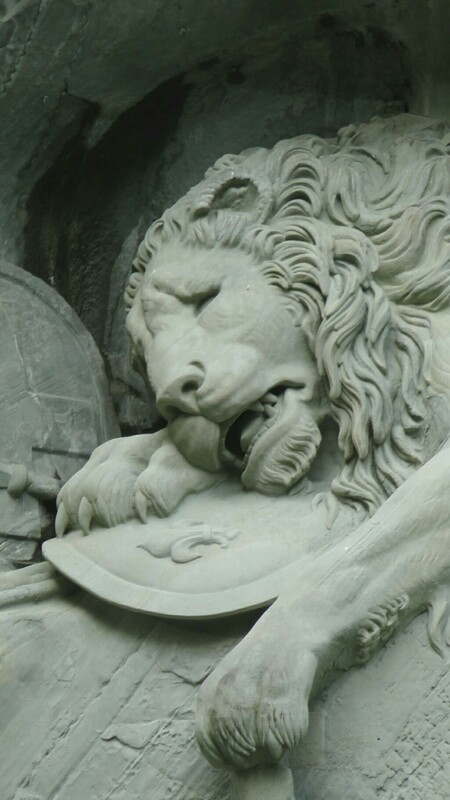 Carved by Lukas Ahorn in 1820, this carving of a mortally wounded lion commemorates all the Swiss guards of the French royalty who died during the French Revolution in 1792. 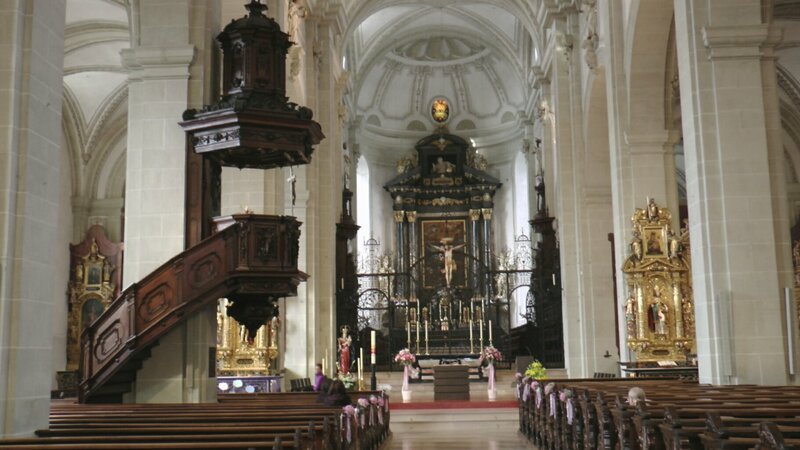 We also really liked the Luzern church downtown. 40 minutes later, we were back in central Zurich. We bought some dinnerish things at a grocery store and ate them by the river. 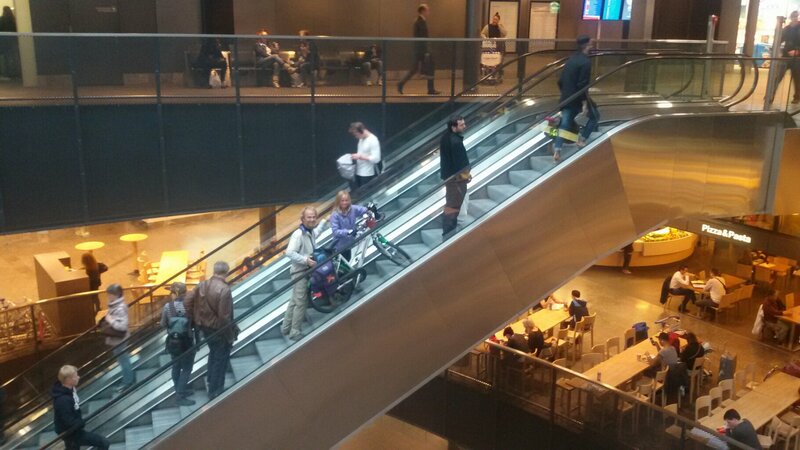 I noticed that the grocery store was packed with people on this Saturday night, because everything in Switzerland (and Germany) is closed on Sundays. Somehow, it never occurred to us that maybe we too should stocking up for Sunday. More on that later. Omar and Tanja had gone out for dinner that night with friends, so we just took the train back to Rmlang and went to bed. The next morning, my dad made omelettes for all of us! 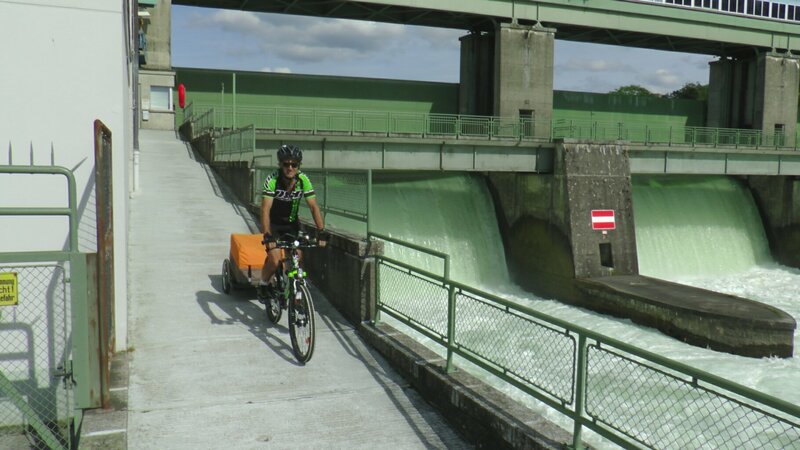 We really enjoyed our short stay in Zurich, but we had to keep going. Thanks, Omar and Tanja for hosting us! It was so much fun to see you again! Omar leaving for his soccer game. 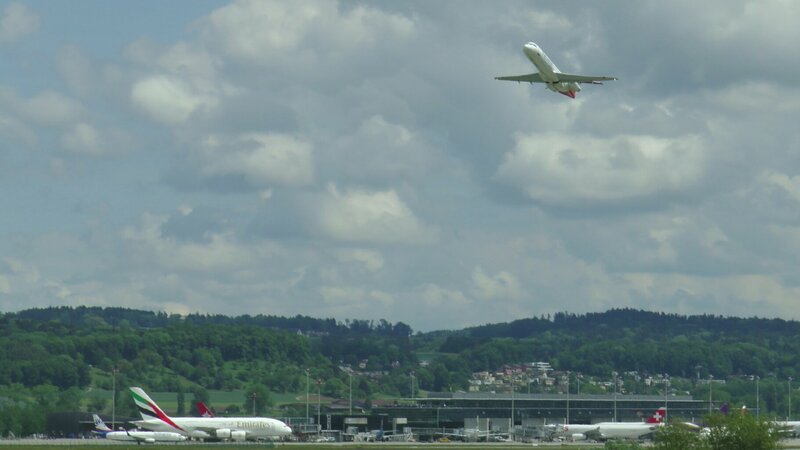 To leave Zurich, we went past the airport. It is the 10th busiest one in the world! The Emirates plane on the tarmac is an Airbus A380, the biggest in the world! As I said before, we forgot that on Sunday, everything closes. This is not a new problem for us – I think that we have forgotten about every single Sunday so far! We really do like that idea, though, because it means that families are together on that day. But coming from Canada, where most stores are open 24/7, we aren’t used to it. We had no food for lunch. Luckily, we found a very Swiss little restaurant that was open. This is very typical German/Swiss food. Buns, cheese and meat is usually for breakfast, though. We were right near the German border. 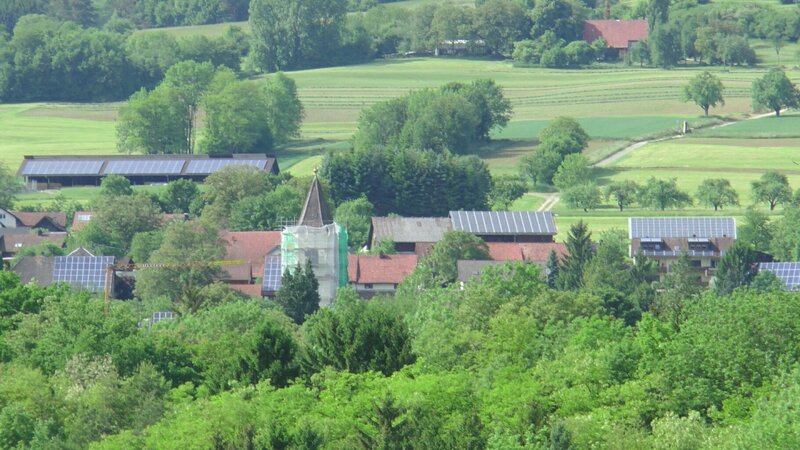 Looking across the river from the south side, we saw a lot of solar panels! Crossing the border back to Germany was just as easy as it had been the other way around. This time, all we saw was a teeny tiny little sign that said something about “Deutschland” on it. That evening, we had to eat dinner at one of the few places that’s open on Sundays: McDonalds. Those are pretty similar to the ones in Canada, except that they have a bakery. 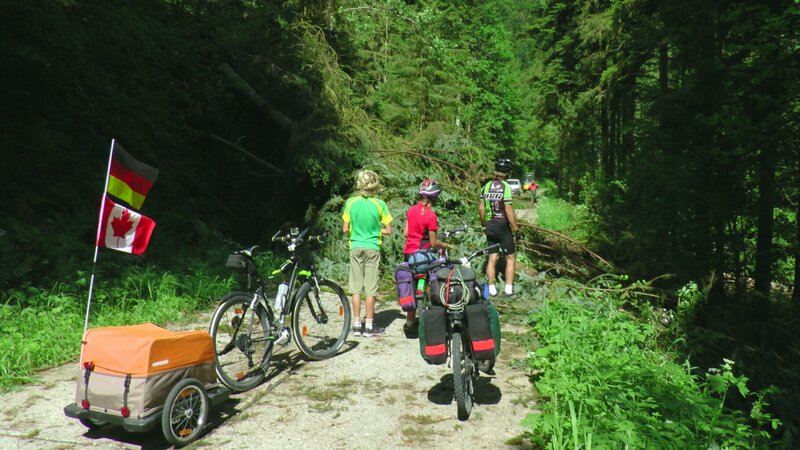 We got a few slices of black forest cake, as the next day we would be riding through it’s namesake: the black forest. After dinner, we rode way uphill. It was really steep for a long time. We didn’t need a campground, just a flat spot, but we didn’t have any breakfast for the next morning, because stores were closed. 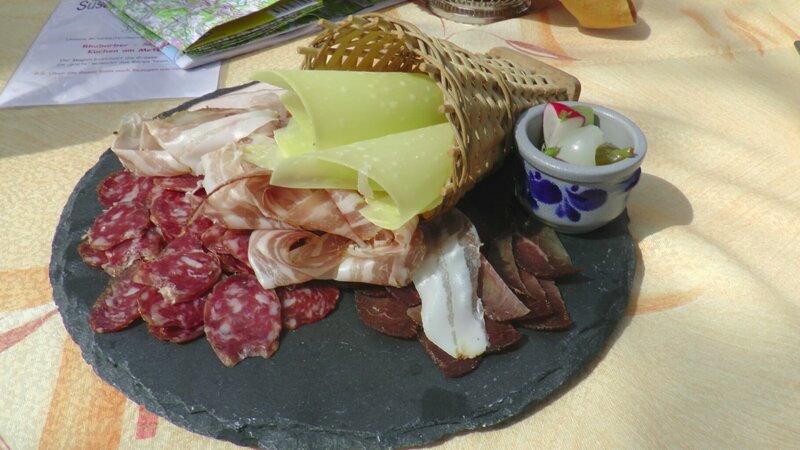 We would have gone further out of a town, but we stopped in Aichen for the night because there is some food there. Actually, there are no grocery stores in Aichen, just a small guesthouse with an attached restaurant where we could go for breakfast. We set up our tent in a parking lot-ish thing at the edge of the tiny village. It was right near the church, which ended up to be very irritating! 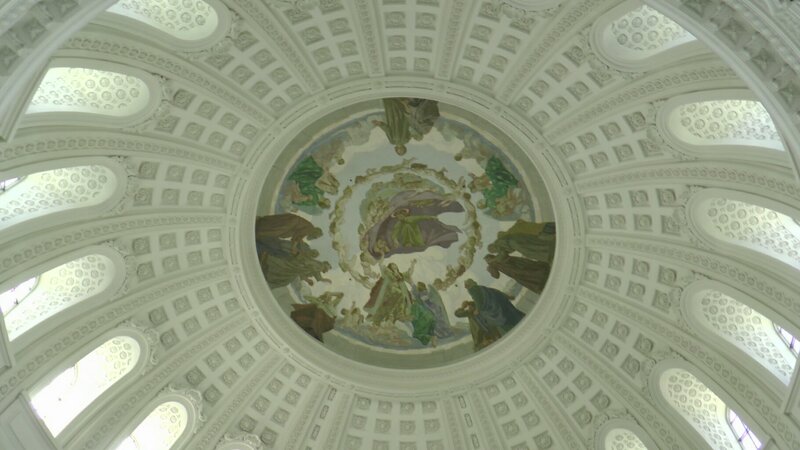 This church would ring once on the -15 minute mark, twice on the half hour, 3 times on the -45 minute mark, and then whatever time it was on the hour. But the worst part was that it did that all through the night! Yes, we were camped right next to a church that rang once every 15 minutes all night! At 6 AM, there was the big village wakeup call, and it didn’t stop ringing for about 5 minutes. Jake and I actually managed to sleep through most of it, but my parents had a pretty rough night. For breakfast the next morning at the guesthouse, we were surprised at first because they never came around to show us a menu or take our order. But then we realized that breakfast is breakfast: fresh rolls, cheese and meat. Yum! 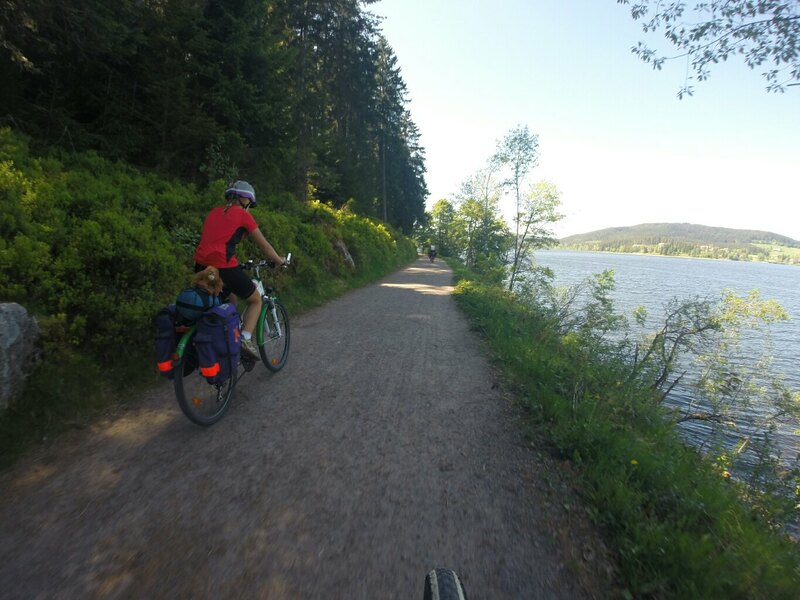 When we first came to Germany and did a bit of research about the best places to visit, one thing that stuck out in our minds was the black forest in southwestern Germany. It is the country’s “wildest” place, and the photos on the internet made it look lovely. 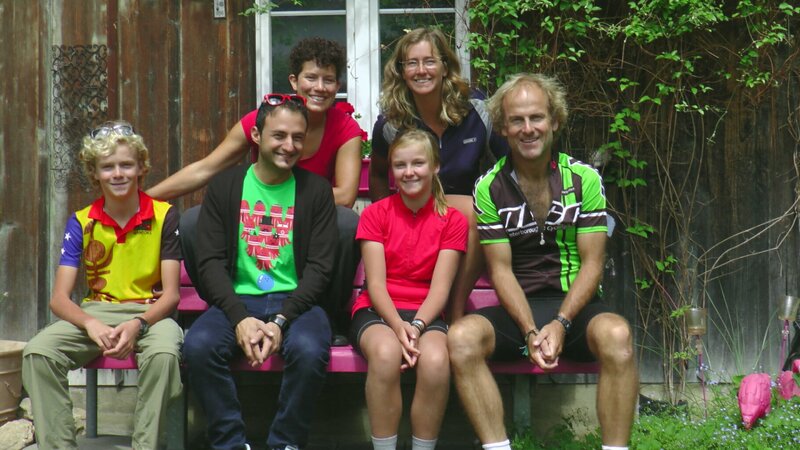 On this day leaving Aichen, our plan was to cycle through the black forest and finish in Freiburg, where we had already found some people on the Warm Showers network to stay with. We use google maps most of the time to get around. When it finds a route for us, it also gives us a profile of ups and downs for the day. For this day, it was: a short but steep down, then a huge up then a huge down. The black forest really was lovely! It was so peaceful and quiet. We would go for long periods of time without seeing anybody! Oh, no! A big branch fell across the path! 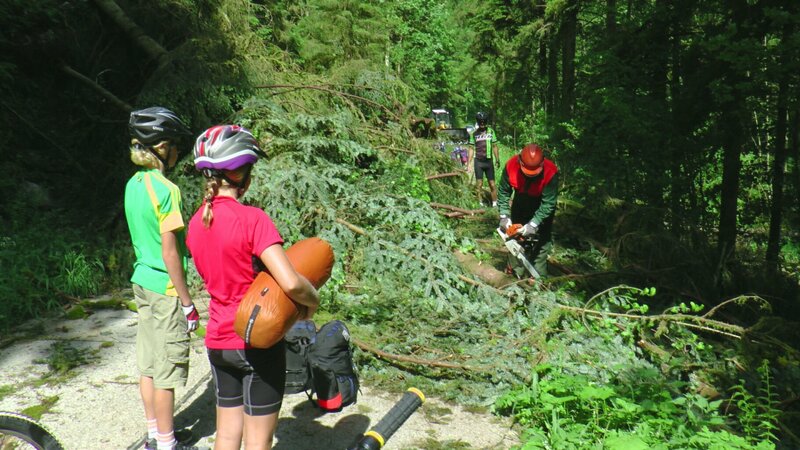 Should we carry our bikes over? Oh, no worries. A man with a chainsaw cut it up for us. We stopped for lunch beside a big lake. 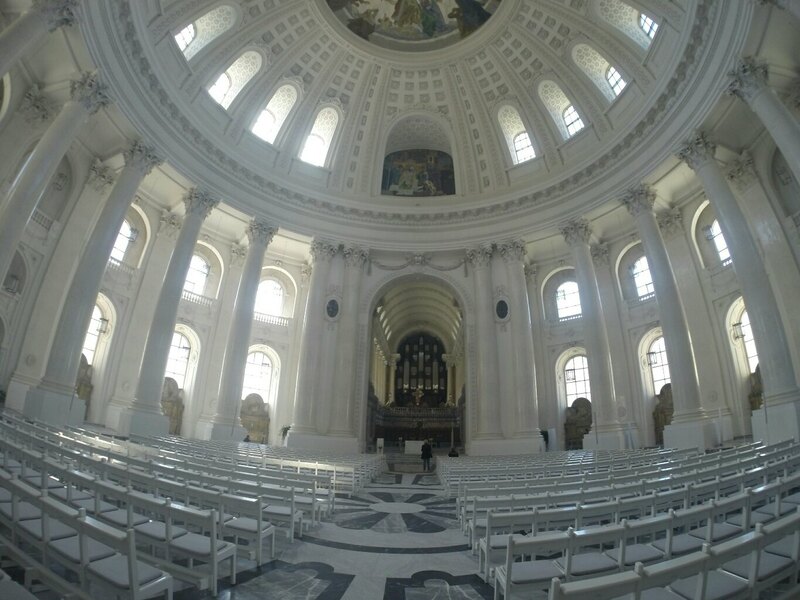 In the quaint village of St Blasien for our bakery stop, we saw the most amazing church! 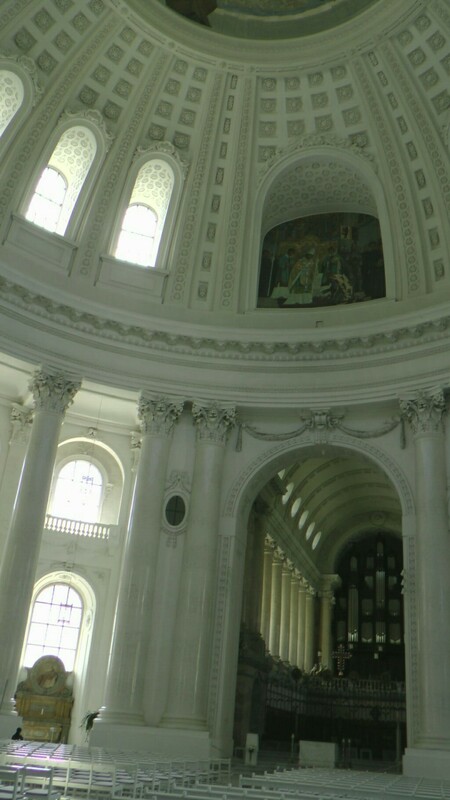 Wow… such a huge church for such a tiny town. After getting some calories from the bakery, we continued on our big long uphill. All day, we kept thinking “in a few hours, we will be gliding downhill all the way to Freiburg!”. My dad kept saying “it’s all down from here, guys”. Then we would continue going up. “OK, we must be near the top of this hill!”. We just kept going up. At around 6 PM, we got into a bit of a pinch. We were kind of lost, and every route google maps told us about either didn’t exist, or kept climbing up the hill. We made many wrong turns and wasted so much time. 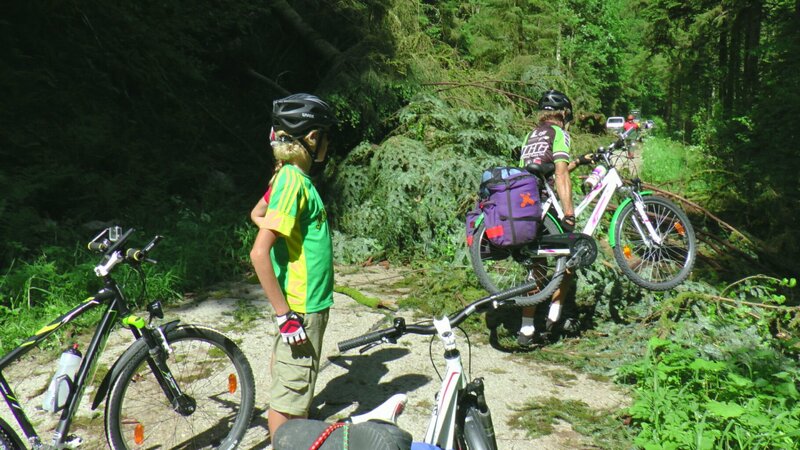 Finally, we found a (downhill) trail that we thought would lead us to Freiburg. Yay, finally our downhill that we’ve been looking forward to all day! But at the bottom, an unpleasant surprise awaited us. 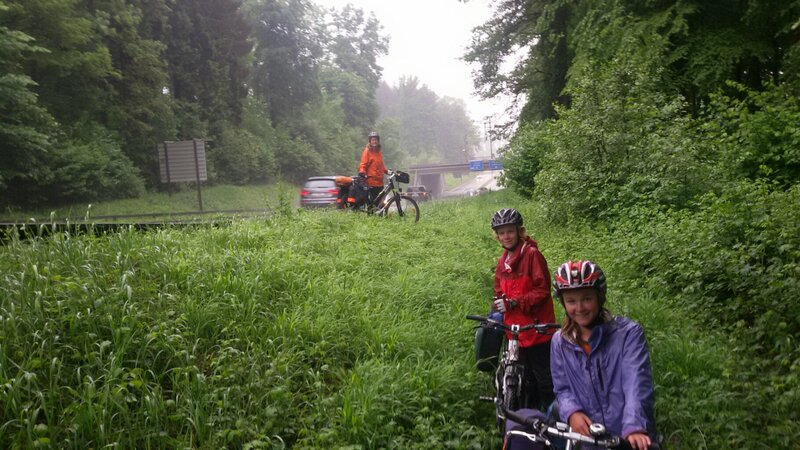 This bicycle path didn’t go all the way to Freiburg, it simply led to a huge highway that went there! But we weren’t going to ride on this highway: we found out later that every transport truck from Romania to Portugal uses this road. 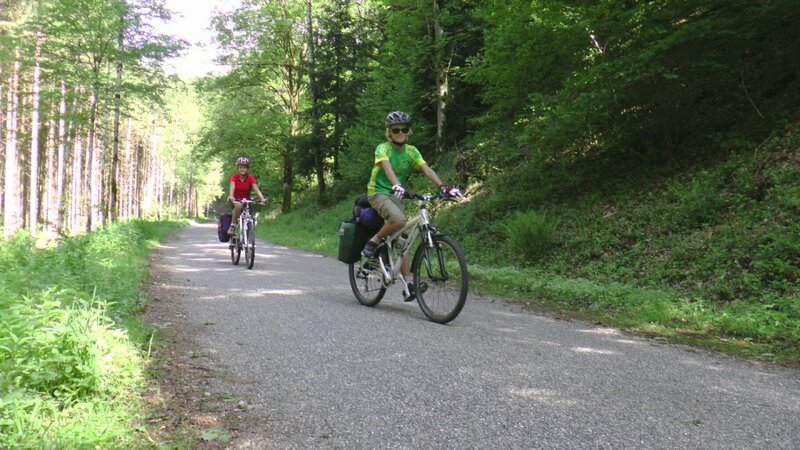 And unlike most other German highways, there was no separated bike lane – not even a shoulder. No thanks! We phoned our warm showers contact Peter to ask for directions. He told us that our best way to Freiburg would be to go back up the close hill and then keep going uphill for a long time before going back down. Oh. Shoot. Or, we could just go up the hill for a kilometer or two to a place called Hinterzarten where we could catch a train to Freiburg instead. Yes, that sounds better! But it was already quite late, and we were too tired for that. OK, we’ll pitch our tent here and climb the hill and take the train in the morning. We set up camp right under a really cool train trestle. It was a cold night. At least Galdis is warm! The hill we were to climb the next morning was so steep, there was no way we would make it up with our loaded bikes – even pushing them wasn’t an option. But my dad found an innovative solution. He talked to a very nice family that lives halfway up the hill. They agreed to meet us at the lowest car turnaround spot, and put our gear into their car. Then, we could ride up with empty bikes. They would leave our gear at the top near the train station, for us to collect when we made it up. It all worked very smoothly. 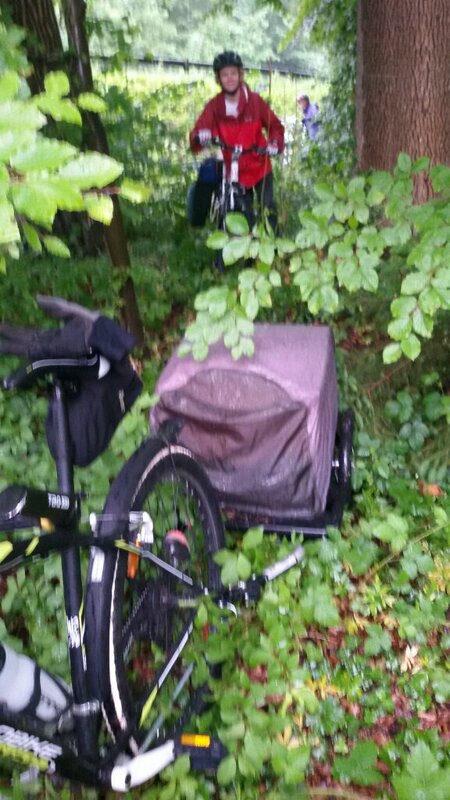 Three of us made it up empty without pushing our bikes. We found the train station in the town of Hinterzarten, and caught the 40 minute train into Freiburg. It was the most downhill train I’ve ever been on. That was the downhill that we were hoping to ride the previous day 😦 . 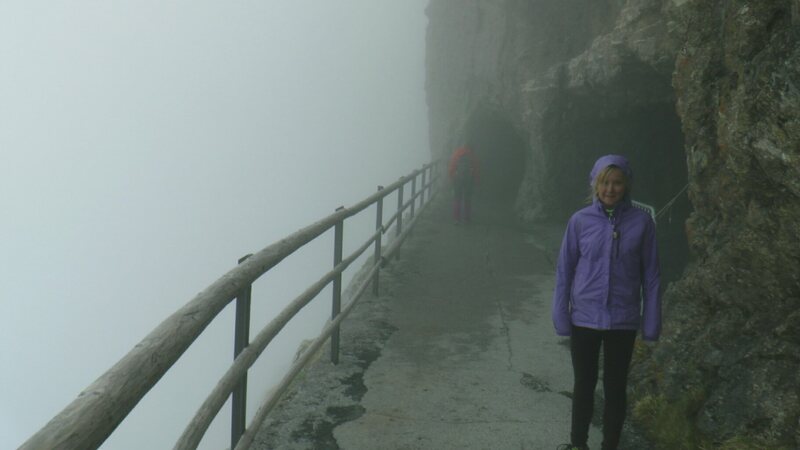 Our time in Switzerland and the black forest had many mishaps or “problems” (in the Zurich airport, lost on Swiss highways in the rain, separation in Luzern, forgetting about the Sunday closings and getting lost in the black forest). Though these problems seemed somewhat big at the time, they really weren’t. And compared to the problems in Nepal or Vanuatu, ours are just laughable tiny inconveniences. And, we really enjoyed these places! 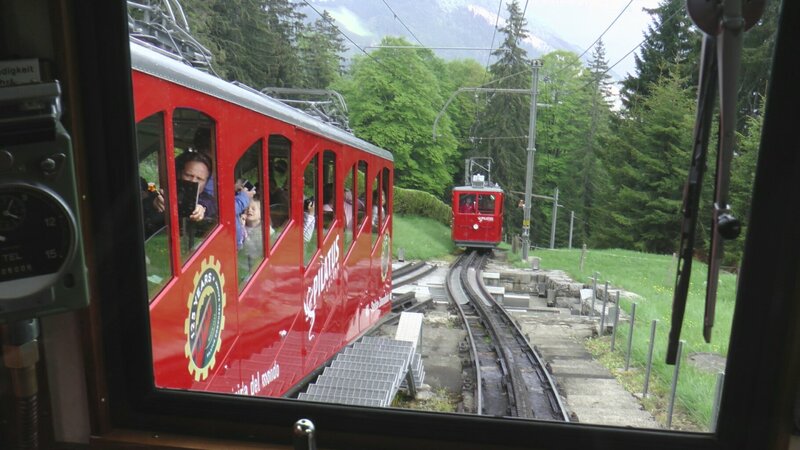 Taking the cog railway up the Pilatus mountain on a 48% incline was very exciting. Seeing Omar and Tanja was so much fun! Forgetting about the Sunday closure gave us an excuse to splurge at restaurants and eat great food. And the black forest was still just as beautiful and peaceful, even though we were going up. OK, they aren’t mishaps. Neither are they problems. They are just funny stories that improved my blog post.